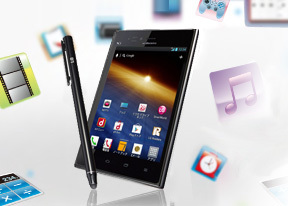 The LG Optimus Vu comes with an 8 megapixel camera, capable of capturing 3264 x 2448 resolution images. There is a single LED flash, but it won't be of much help in most low-light situations. We found the user interface to be quite convenient, though many of the important settings are inside the extended settings menu, so they take a while to toggle. From the viewfinder you have access to the front/back camera toggle, digital zoom control, exposure compensation and flash mode. The extended settings let you adjust things like resolution, face detection, geotagging, ISO, white balance, self timer, scene and shot modes (the last two really should have been made available on the top level in the viewfinder). While there is no hardwired shutter key, pressing the volume keys will snap a photo (either one works). It's not such a good idea though. First, the volume keys don't obviously have half press and second, it's hard to comfortably hold such a wide phone. Of course, there's the virtual on-screen shutter button as well. Photos from the Optimus Vu have quite a bit of noise in them and the post processing algorithms that try to suppress it wipe out a good deal of fine detail and there are signs of oversharpening. There's still decent detail left, the colors are accurate and the Vu renders shadows well. Photos look at least as good as those coming from an Optimus 4X HD. Here are a few sample shots we've taken with the LG Optimus Vu. The LG Optimus Vu joins the long list of tested devices in our photo comparison tool. The page of the tool has information on how to use it. The LG Optimus Vu doesn't perform as well on our synthetic resolution chart as the Optimus 4X HD, but at least it doesn't have that huge pink spot. Noise reduction is less aggressive and leaves the grass and gravel squares in the second chart in fairly good standing. Under artificial lighting, there's a slight blue tint to the photos. The Optimus Vu's camera is capable of shooting 1080p videos at 30fps. The camcorder has the exact same settings available on the viewfinder as the still camera. From the extended settings menu you get a few more - resolution, white balance and color effects. Videos are recorded in MP4 files with a bitrate of 10Mbps, which isn't enough for FullHD. The framerate is stable at 29fps, but a lot of the fine detail is lost to compression. Colors are okay, but the whole scene gets overexposed. That and the continuous autofocus doesn't know when to stop hunting. Sound is recorded in stereo, with a sampling rate of 48 kHz and 155Kbps bitrate. Here's a video sample we've uploaded on YouTube. Don't forget to switch the resolution. And here is an untouched 1080p@30fps (0:05s, 8.9MB) and 720p@30fps (0:09s, 13.5MB) video samples taken with the Optimus Vu. Compression artifacts are visible across the frame, but the Optimus Vu still manages to keep decent amounts of fine detail. When the lights go out, the situation isn't very flattering - everything becomes very dark and most detail is lost. The final chart shows that there's strong sharpening going on, but again no pink spot unlike the Optimus 4X HD.